Located between the rivers Tweed, Bowmont Water and Glen in northern Northumberland, the research area covered by the Flodden 500 Project’s archaeology programme has produced material indicating human activity over a period of nearly 10,000 years. Whilst the individual finds are important as evidence of the human role in shaping the current landscape, they take on additional significance when seen in the context of our existing knowledge of the region’s prehistoric archaeology. The Project’s earliest evidence for human activity comes from the archaeological field-walking programme. Every field surveyed has produced flint and stone tools spanning the period from the Later Mesolithic (Middle Stone Age) c. 9-8000 years ago, up until the end of the Iron Age in the first millennium BC/AD. Many of these finds represent the by-products and waste material from stone tool manufacture, use, and, ultimately, discard, and they give us a clear insight into the range of raw materials that were routinely exploited by prehistoric communities. These included, flint, chert, agate, quartz, quartzite and a range of fine grained rocks used in the production of large tools such as axes and hammers. All of these raw materials were probably available in the local drift geology deposits and their presence in the archaeological record indicates the highly developed, local, knowledge that was held about the potential sources of these important stone types. Past surveys have shown concentrations of later Mesolithic sites in the Tweed Valley (Mullholland, 1970) and in the Milfield Basin to the south of the Flodden area (Waddington and Passmore, 2012a, 112-140; Waddington, 1999). The Mesolithic material from the Flodden 500 survey fills a significant gap in the distribution pattern between these two areas. Most field-walking collections have probably been accumulated over a long time-period, as a result of multiple human activities in possibly preferred settlement/activity locations. As a result, surface-collected lithic scatters are difficult to date, and usually only a small fraction of the material collected is chronologically diagnostic. With that caveat in mind, several finds from the fields in the Flodden survey area are clearly of later Mesolithic date. These include material from Field 1 (microliths and scraper forms), Field 2 (microlith and core types) and Field 5, where characteristically Mesolithic blades, blade-like flakes and blade segments (the latter often used in the manufacture of microliths) make up some 15% of the total lithic sample. Field 18 produced an example of a later Mesolithic drill bit or piercer, known as a ‘Meche de Foret’. This was made on a quartz flake. All of this material comes from a time when Britain had become an island, with the drowning of the North Sea ‘Doggerland’ area (the land bridge, named after the Dogger Bank, which had linked Britain to the rest of Europe for millennia). Sea levels rose as the melting of the last glacial ice sheets reached its final stages. The improving climatic conditions created an almost totally forested landscape in the region, with a rich flora and fauna, the latter dominated by red and roe deer, wild cattle and wild boar on land and a variety of fish species in the developing river systems. Later Mesolithic hunters and gatherers created small woodland clearances, promoting the growth of wild food plants and making the movement of game animals more predictable and their hunting easier. The microliths recovered in the Flodden 500 survey were probably armatures (points) from later Mesolithic arrowheads and the scrapers and blades were probably used in the butchery of hunted meat and the resultant preparation of leather from animal hides (it should be noted, however, that even simple scraper types could have been used to work a wide range of organic raw materials). A review of the Mesolithic environmental background is set out in recent work by Passmore and van der Schriek and Passmore and Waddington (2009; 2012). With the advent of farming from around 3900-2000BC we move into the Neolithic or New Stone Age and in terms of broad chronology this is followed by the Bronze Age (2000-1000BC), which saw the first use of metals. A concentration of artefacts, and archaeological sites, from these periods is known from the Milfield Basin and the region immediately around the Flodden study area. This material has been studied in detail and innovations include the first use of pottery in the Neolithic period and also the development of larger, more robust stone tools such as polished stone axes. Rock Art, including the cup and ring marked stones for which this part of northern Northumberland is famous, also makes its first appearance in the Neolithic period (Waddington and Passmore, 2012b, Fig. 5.6,154). By the Bronze Age, with the development of Beaker pottery, the first use of copper and bronze, and the evolution of various funerary related ceramic types, an important ritual element developed in the local landscape. 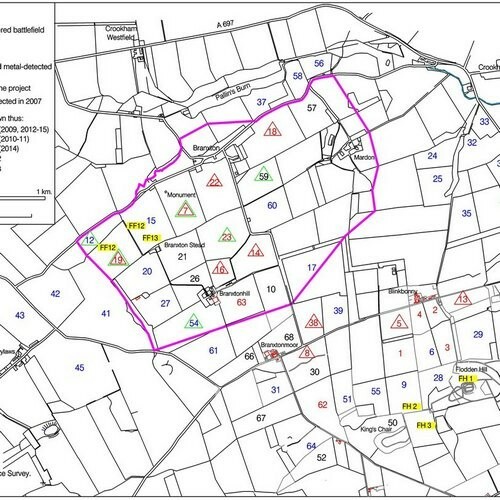 Concentrations of enclosures, known as henges, have been identified in the Milfield area. No such sites were identified in the course of the Flodden 500 survey, though recent work on air photographs by Tim Gates has revealed a possible henge at Ford Bridge West (NT 9332 3716). He has also identified a whole series of ring ditches, showing up as crop and soil marks on air photographs, which may be the remains of Bronze Age burial sites within the environs of the Flodden study area (Gates 2012, 58 – 110). In terms of Neolithic and Bronze Age artefacts from the field survey, the Flodden 500 Project has produced three examples of Neolithic/Bronze Age flint knives. Field 1 produced a simple, retouched example on a good quality, dark grey, flint flake, retouched on its right edge and around both ends. Field 2, however, produced two fine examples of classic Early Bronze Age plano-convex flint knives. One example is on an inner flint flake and the other is on a secondary removal. Both had been elegantly retouched, exhibiting regular scalar working on their dorsal faces. True planoconvex knives, like these, are usually seen as Later Neolithic/Early Bronze Age in date, with a close association with burials containing Early Bronze Age Food Vessel pottery (Simpson, 1968). Strangely, in this region, no Neolithic leaf shaped arrowheads or Bronze Age barbed and tanged arrowheads were recorded in the course of the field walking. That said, a fragment from a possible Bronze Age tanged implement was recovered in the excavations on Site 1 at Flodden Hill. Trenches 16 and 17 at the Flodden Hill excavations also produced two examples of probable Neolithic polished stone tools. The example from Trench 16 certainly seems to be a polished axe, with facetted edges. Waddington and Passmore have outlined the local distribution of polished stone axes (2012b, Fig. 5.6, 152) and several have been recorded in the Milfield Basin and in the area to the north of Flodden. The two examples noted above are further additions to the growing body of Neolithic material culture being recorded in this part of North Northumberland. One final, possibly Neolithic, stone artefact should be mentioned here. The excavations at Flodden Hill Site 3, produced a piece of fine grained, grey/fawn, sandstone with what appears to be a pecked and ground hollow or ‘cup’ on one face. If this is not a natural phenomenon it could well be a rare example of a portable, Neolithic, cup marked stone. Waddington and Passmore have recently highlighted how the Iron Age period in the north east region has become a vibrant area of research (2012c, 223-258). The early Iron Age is the least well understood phase of the period and most dated activity from Iron Age Sites in the region tends to span the last two centuries BC and the first two centuries AD (Waddington and Passmore, 2012c, 223). Michael with the Iron Age pottery he found on the Flodden Hill excavation. The recent excavations on Flodden Hill have concentrated on the upstanding Iron Age earthworks, Flodden Hill Site 1, a rectilinear enclosure (initially identified on an air photograph), off the main hill, at Flodden Hill Site 2 and Flodden Hill Site 3. Important assemblages of Iron Age pottery have been recovered from all three, with Site 1 producing 22 sherds of pottery, Site 2 producing 101 sherds of pottery and Site 3, 4 sherds of pottery and fired clay. This total probably represents some 53 separate vessels,(13 from Site 1, 37 from Site 2 and 3 from Site 3) all of which are hand built, using locally available clay sources. This might seem a small sample of material but in the context of local Iron Age studies, where ceramic finds usually only occur in only small numbers, these pots are of immense significance. The majority of the vessel types recorded are jars (either barrel or straight-sided types) and these are amongst the commonest of Iron Age pottery forms identified by Waddington and Passmore in their recent summary of Iron Age pottery within the immediate region of Flodden Hill (Waddington and Passmore, 2012c, 245). The Flodden vessels can be paralleled at local sites like West Dodd Law (Smith, 1989), and Fawdon Dene (ASUD 2001; Frodsham and Waddington, 2004). They also have affinities with material from sites further afield in the region, e.g. South Shields ( Hodgson et. al, 2001), East and West Brunton (Waddington and Passmore, 2012c, 245), Pegswood (Willis, 2002), Murton High Crags (Jobey and Jobey, 1987), Burradon (Tyne and Wear) (Jobey, 1970), Thorpe Thewles (Cleveland) (Heslop, 1987), and Catcote (Cleveland) (Long, 1988; Vyner and Daniels, 1989). Vessel 25 from Trench 8, Site 2 is a rare example of a decorated Iron Age pot. It has a smoothed interior and exterior, a slightly everted (out-turned) rim and a raised, pinched, cordon some 90mm above the base and below the rim. The outer surface is decorated with finger pad impressions, similar to those recorded on a vessel from Pegswood (Willis, 2002). The Flodden Hill Iron Age pottery is part of a long-lived ceramic tradition spanning the first millennium BC into the Roman period which saw limited typological and formal change over this time. As a result, despite the lack of obvious Roman pottery forms, it is possible that occupation at the sites went on into the Roman period. Using a rotary quern to grind grain (drawing by Alan Braby)Unfortunately, given the nature of the pottery, and lack of any detailed typological development, it is impossible to suggest tight dates for the occupation of the sites on the basis of the ceramics alone. Other possible later prehistoric finds include a series of fine grained whetstones (stones usually used to hone metal blades), recovered from both the field walking and the excavations Several stone hammers have also been recorded. Finds like these are common on most later prehistoric settlement sites in the region. Flodden Hill Site 2 also produced the top stone of a typical Iron Age rotary quern, used in the grinding of grain. These are a common find on nearly all rural settlements of the first millennium BC in the north-east region e.g. West Dodd Law, Murton High Crags, Fawdon Dene Enclosures 1 and 2, Pegswood, South Shields( Waddington and Passmore, 2012c, 245), Bollihope Common (Young, Webster and Newton, 2006). In north Northumberland they are typically made of Cheviot rocks such as andesite, although they are also made from gritstones and sandstones, implying the widespread trade of bulky and heavy materials across the region (Waddington and Passmore, 2012c, 245). The Flodden finds discussed above are further confirmation of the ‘busy’ nature of the Borders area in prehistory. 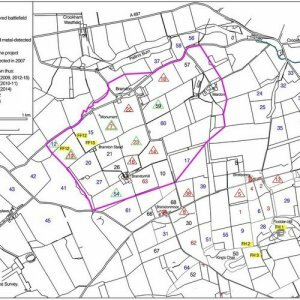 The Project’s results complement work carried out by the Biggar Archaeology Group to the west and north of Flodden, and survey and excavation in the Tweed Valley, Coquetdale, the Till-Tweed Area, the Milfield Basin, and the Bolam and Shaftoe areas. The findings of the Flodden 500 Project’s archaeological programme demonstrate the real worth of co-operation between ‘professional’ archaeologists and local community volunteers. Local archaeologists gain transferable and long-lasting skills from working with the professionals and, ultimately, move from being simply interested ‘consumers’ of ‘professional’ opinion to become active producers of their own archaeological and historical narratives. All of this collaboration clearly widens interest in archaeology and, more specifically, leads to an enhancement of our knowledge of the past in the region and to a better understanding of the way our landscapes have developed over time. Long may such work continue. ASUD (Archaeological Services, University of Durham), 2001.The Breamish Valley Archaeology Project. Annual Report 2000. Unpublished Report No. 756. ASUD, Northumberland Archaeology Group and Northumberland National Park Authority. Frodsham, P and Waddington, C. 2004. The Breamish Valley Archaeology Project, 1994-2002. In P. Frodsham (ed.). Archaeology in Northumberland National Park. York, Council for British Archaeology Report, 136, 171189. Gates, T. 2012. Monuments from the Air. In Passmore, D. and Waddington, C. Archaeology and Environment in Northumberland. Till-Tweed Studies, Vol. 2. Oxford, Oxbow Books. 58-110. Heslop, D. 1987. The Excavation of an Iron Age Settlement at Thorpe Thewles, Cleveland 1980-1982. London. Cleveland, CC and CBA Research report 65. Hodgson, N. et al. 2001. An Iron Age settlement and remains of earlier prehistoric date beneath South Shields Roman Fort, Tyne and Wear. Archaeological Journal, 158, 62-160. Jobey, G and Jobey, I. 1987. Prehistoric, Romano-British and later remains on Murton High Crags, Northumberland. Archaeologia Aeliana, 5th Ser. 3, 1-16. Jobey, G. 1970. An Iron Age settlement and homestead at Burradon, Northumberland. Archaeologia Aeliana, 4th Ser. 46, 293-295. Long, C. 1988. Iron Age and Romano-British settlement at Catcote, Hartlepool. Durham Archaeological Journal, 4, 13-36. Mullholland, H. 1970. The microlithic industries at the Tweed Valley. Trans. Dumfriesshire Galloway Nat. Hist. Antiq. Soc., 47 81-110. Passmore, D and van der Schriek, T. Past and Present Landsapes in the Till-Tweed Region. In Passmore, D and Waddington, C. 2009. Managing Archaeological Landscapes in Northumberland. Till-Tweed Studies , Vol. 1 Oxford, Oxbow Books. 10-74. Passmore, D. and Waddington, C, 2012. Environmental Background. In Passmore, D. and Waddington, C. Archaeology and Environment in Northumberland. Till-Tweed Studies, Vol. 2. Oxford, Oxbow Books. 12-54. Simpson, D.D.A., 1968. Food Vessels: associations and chronology. In Coles, J.M and Simpson, D.D.A. (eds. ), Studies in Ancient Europe: Essays Presented to Stuart Piggott. 1978-211. Leicester Smith, I. 1989. Excavations at Dodd Law West hillfort, Northumberland. Northern Archaeology, 9, 1-55. Vyner, B.E. and Daniels, R. 1989. Further investigations of the Iron Age and Romano-British settlement at Catcote, Hartlepool, Cleveland, 1987. Durham Archaeological Journal, 5, 11-34. Waddington, C. 1999. A Landscape Archaeological Study of the Mesolithic-Neolithic in the Milfield Basin, Northumberland. Oxford, British Archaeological Reports, British Series, 291. Waddington, C and Passmore, D. with a contribution by Peter Marshall, 2012c. Defending the Land. In Passmore, D and Waddington, C. Archaeology and Environment in Northumberland. Till-Tweed Studies, Vol. 2. Oxford, Oxbow Books. 223- 258.